Two days ago, I mentioned that I enjoy biking to work. On days I don't bike to work, I spend 45 minutes at a bike spinning class at my gym during my lunch hour. With all this intense physical activity I'm engaged in, it's no surprise I possess a soaring appetite. 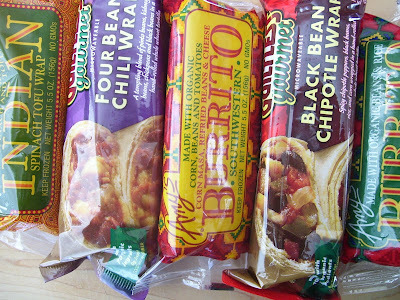 Last weekend, I came across frozen vegan and vegetarian wraps at My Organic Market (MOM's) from Guiltless Gourmet and Amy's Kitchen. Each costs about $3 and contains only about 300 calories. I ate one after spinning class on Wednesday and Friday, along with an apple and an energy bar. They tasted good, and my appetite was fully satisfied throughout the day. Sure beats spending $10 a day for lunch at Au Bon Pain.